For this special post, I've got some colorful, glittery, awesomeness that seemed very fitting! 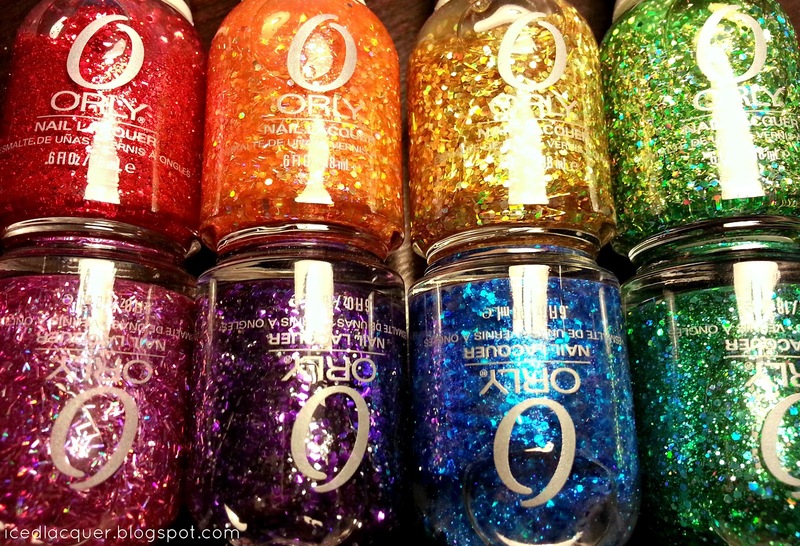 I've been slowly collecting some of my favorite shades of the Orly Flash Glam FX glitters. (Thank goodness for Copious and Sally Beauty 50% off clearance!) I knew as soon as they released promo material for this set that I had to at least get a some of the shades to make up a rainbow of glitter. Shade names: red - Rockets Red Glare, orange - Right Amount of Evil, gold - Sashay My Way, light green - Monster Mash, dark green - Mermaid Tale, blue - Spazmatic, purple - Can't Be Tamed, pink - Be Brave. I could just stare at these bottles all day... mmm. Oh how I long to own (almost) the entire set some day. So with these eight shades, plus two of the Essie Luxeffects (silver - Set in Stones and blue/grey - Stroke of Brilliance) I was able to do a "skittle" manicure using a basic black base. 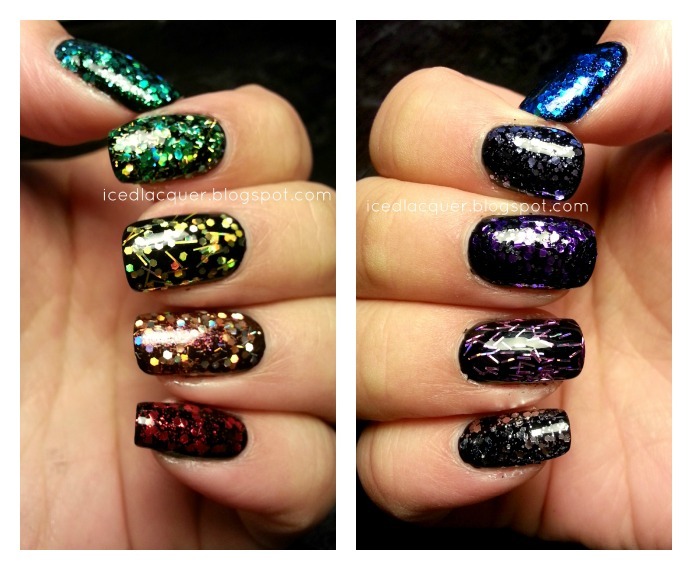 It was so much fun to stare at all the different sizes and shapes of glitter on each finger! If I had to pick a favorite, I think it would be Spazmatic because of the gorgeous blue micro shimmer in the base. And there you have it! I'll have to repeat this one some time, possibly when I have 10 of the Flash Glam FX colors. Also, I didn't get a chance to take photos in natural light, which I think would have made these pictures more impressive. Congrats on your 100th post! I hope to get there someday, haha. I would have worn that skittle mani for days, so gorgeous! Thank you! Haha looking back it seems like time has really flown. I almost didn't even notice it was 100! Thank you! <3 I think it would also be cool to layer each glitter over a base color similar to it to do even more of a skittle look! Congratulations on the 100th post! :) beautiful polishes! Very pretty! You make me want these!